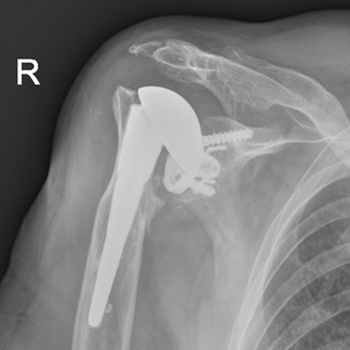 Case: A 65-year-old man, with a history of infection of his shoulder prosthesis, presented with multiorgan failure and notable myalgia likely caused by toxins. The patient was treated successfully with antibiotics and prosthesis removal. Conclusion: This case suggests infection by GGS should be considered in a patient presenting with myalgia associated with sepsis. Barnham MRD, Weightman NC, Anderson AW, Tanna A. Streptoccocal toxic shock syndrome: a description of 14 cases from North Yorkshire, UK. Clin Microbiol Infect 2002;8:174–181. Wagner JG, Schlievert PM, Assimacopoulos AP, Stoehr JA, Carson PJ, Komadina K. Acute group G streptococcal myositis associated with streptococcal toxic shock syndrome: case report and review. Clin Infect Dis 1996;23:1159–1161. Baxter M, Morgan M. Streptococcal toxic shock syndrome caused by group G streptococcus, United Kingdom. Emerg Infect Dis 2017;23:127–129. Stevens DL. Streptococcal toxic-shock syndrome: spectrum of disease, pathogenesis, and new concepts in treatment. Emerg Infect Dis 1995;1:69–78.